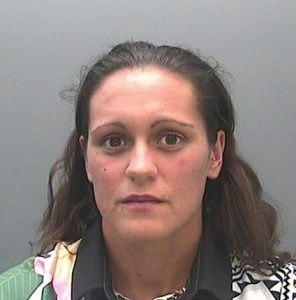 Rhian Nokes used her position as a popular gym teacher – and a former Welsh international footballer – to impress the young girl, befriending her over a period of three years before moving on to emotionally and sexually abuse her. The 29-year-old from Taibach initially denied seven charges relating to sexual activity with a child aged 13 to 15, but changed her plea to guilty mid-way through a trial at Swansea Crown Court. The court heard the young victim, herself a keen sportswoman, was in awe of Nokes and began to see her as a trusted friend during the early years of comprehensive school. By the time the girl had reached Year 10, Nokes – who falsely claimed to be married – had given her her personal mobile number and the two were in regular contact. But that contact stopped abruptly in late 2011, with the victim’s messages going unanswered for days. When Nokes eventually returned the messages, she claimed she had discovered she had a brain tumour and had been given a terminal diagnosis. Contact between the two increased dramatically, with the victim carrying the burden of keeping Nokes’ alleged diagnosis a secret. Officers investigating the case described the defendant as “persistent and determined” as they discovered she had sent in excess of 12,000 texts to the victim. They two began meeting in Nokes’ car, where the relationship became intimate, and later at the victim’s own home, after Nokes persuaded her victim to introduce her as an nineteen-year-old friend from a local football club. On several occasions, the defendant used her apparent distress over her cancer diagnosis to persuade the victim to touch her sexually, under the pretence that the teenaged girl was examining swelling and soreness. The court heard that shortly before her sixteenth birthday, the victim suggested telling her mother about the relationship, but was persuaded by Nokes, who was described by the victim as “controlling”, to keep it a secret. The victim broke off contact shortly after her sixteenth birthday, after realising she’d been lied to, and “blocked out the abuse” until early 2017 when she disclosed what had happened to her. Nokes was arrested and it was soon established that she had never suffered from cancer, and it was just one of many lies she’d used to manipulate the young girl. In her victim impact statement to the court, the victim, who is now an adult, said: “When Rhian told me she was terminally ill and had no one else to turn to, I had nothing else on my mind but wanting to be there for her, I felt like her only hope and support mechanism. “It was a very intense time. The focus was always on Rhian and how she was feeling physically and emotionally; she manipulated my life troubles into hers and controlled everyday life. “I had no reason to question her as I believed every word that she said. I soon deteriorated into an emotionally drained mess. “She controlled every aspect of my life and soon ensured that I distanced myself from my family, friends and partners, who up until now had been a huge part of my life. “Rhian took my childhood away from me to fulfil her own needs. She stopped me playing football and I turned down the opportunity to represent my country. I gave up everything for her because she would inform me that she was so ill she wouldn’t be here long and might not be still alive on my return from playing. Speaking after today’s sentencing at Swansea Crown Court, Detective Sergeant James Morris said: “Rhian Nokes used her position of trust to prey on a young, impressionable girl. The victim in this case admired Nokes and all she had achieved, but Nokes used this admiration and a string of callous lies to groom her for her own sexual gratification. “The victim in this case has shown considerable strength and courage in coming forward to report the abuse she suffered, and today’s result is testament to her bravery throughout the investigation and court process, during which she had to give evidence while Nokes continued to maintain her innocence. “I hope today’s results gives her some comfort as she comes to terms with the abuse she suffered and attempts to rebuilt her life.